Against all odds, Ronak had followed another tipp that a Shistavanen had been sighted in the Capital city of Bakura, Salis D‘aar. The planet offered large parts of wild territory, forests, mountains and plains where a scout could be needed for hunting down unwanted wildlife. Hiring one of his siblings or his mother thus made sense. Less naive than all those months ago when he had left Uvena Prime, the young wolfman was still no hard-boiled negotiator. As he entered the cantina, where his contact had tipped him off to ask questions, he let his gaze pass over the customers. Folks of various kinds seemed to have gathered here, a Wookie played darts against several Rhodians, some Mandalorians were gathered around a table laughing out loudly, but a Shistavanen wolfman was nowhere in sight. „Greetings. Your house ale, please“, Ronak ordered in the way he had been told and passed the credits to the barkeeper. Suspiciously, the Twi‘lek barkeeper eyed him for a moment, before passing him a drink. „Take a seat in the corner. Your contact will arrive soon“, he replied with a crooked smile. Nodding a thanks, Ronak took his seat and kept his gaze out waiting for the informant who would be able to tell him about this wolfman who was supposed to be on the planet. As any Shistavanen Ronak possesses an excellent sense of smell and hearing, as well as night vision though not exceptional for his species, unless he is concentrating really hard focussing his ability of the force although he is unaware of this being the force at work. His keen senses sometimes prove to be a weakness, as he suffers particularly under extreme smells, loud or high-pitched noises which are distracting or even dizzying at times for him. His sense of smell also helps him in detecting people‘s emotions like fear or nervosity even when they try to hide their true emotions. This is a skill which does not work with droids which makes him feel particularly uncomfortable in the presence of droids or other creatures who possess no scent. Ronak is a skilled survival expert, having partially grown up in the wilderness of Uvena Prime, learning to hunt, gather, find shelter, treat injuries and sickness as well as improvising tools and crafting basic things from very little base material. For a Shistavanen Ronak is quite interested in other species and quick at learning about new things. This made him turn towards hunting and scouting as a profession which helps him sate his curiosity and delve into the spirit of exploration. On the one hand, this curiosity combined with a quick mind which gives him a knack towards trying out new things and learning new skills and abilities easily. 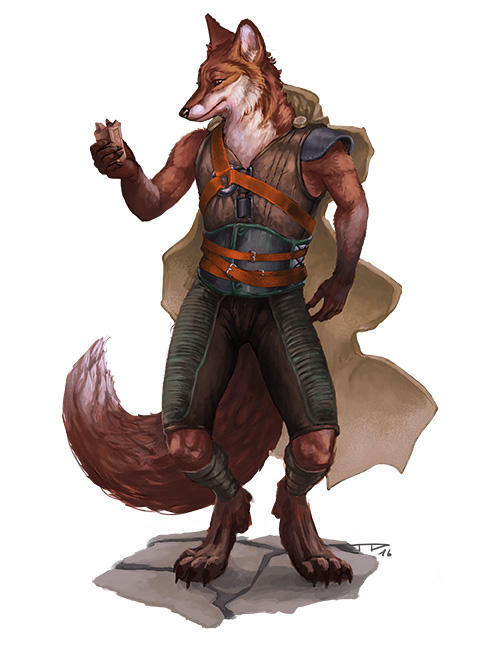 On the other hand, Ronak‘s curiosity for other creatures and species, for secrets or exploration drive him towards sometimes life threatening situations, whether it is following a new track of an unknown creature or trying out a gambling game in a smuggler‘s den. Ronak is not a brutal character, as his wish to learn something lets him try to rather be friendly or defensive or than aggressive or offensive. However, this is not what people expect from a young Shistavanen with obvious sharp teeth and claws which is the reason why he is usually not greeted in even half as friendly the way as he would hope. Even though grieving him this has also trained his reflexes towards defense and dodging attacks exceptionally. What often fails with humanoids, more often goes right with animals which appear to take a liking to him more often than usual making him skilled in knowing animals behaviour and even being able to train or ask some tricks of them (bribing them with treats or unknowingly intervening with his force abilities). His animal empathy not only lets him act responsibly as a hunter, not killing a mother animal with younglings, or relieving a wounded beast from its misery instead of letting it die slowly and saving the effort. His understanding of animals also lets him stand up for maltreated animals, whether it may be the stray beast being beaten in the streets by kids or ones misused for fights and bets by the Hutts. Being a Shivastanen Ronak has a strong pack mentality, being self-less and loyal in cooperating with those he considers his friends and thus members of his pack. Having been brought up in a very sheltered environment, Ronak is quite naive and trusting towards others, much more than most of his species. He tends to see the good in people, beacuse he want to be on friendly terms with most. When standing fully upright, Ronak stands 1.98 m tall. Usually, he stands slightly bent in the knees which makes him appear somewhat shorter. His stature is more sinewy and lean than heavy muscled, as he relies more on stealth, fast reflexes and quick movements than raw strength. Ronak‘s fur is red-brown with white fur from his lower muzzle down his chest to his belly and at the tip of his tail. This together with his rather elongated muzzle give him more of a fox-like than wolvish appearance. Typically when hunting, scouting or sxporing he wears a sleeveless leather vest and leather breachers for protection, as well as leather strips around the shins. Usually he wears at least one or two belt pouches to carry small items and necessities around. A virbo-bladed hunting knife and blaster pistol also typically accompany on scouting missions which are explorations he gets paid for in his eyes. For scouting missions, he tends to die his fur dark to be less detectable in the dark where he needs no light sourcedue to his night vision. Ronak was born on the Shistavanen home world Uvena Prime. His parents were among the more open-minded of their people who were willing to take employment by outsiders and even leave their planet for some time to travel to other worlds. As a young pup, he and his siblings would be trained by their father Urrouk in the art of scouting and hunting, staying out in the wilderness for longer and longer trips the older to pups would get, while their mother Rokar was often off-world on missions. Whenever she came home to the family he would love to hear her tales of distant worlds, animals and people with strange habits. Dreaming of the day when he would leave the world himself to explore all these strange worlds. His older brother Veruk would take great pride in being the strongest fighter. Ronak soon learned that he would never beat their strength and rather tried to be faster, focussing mainly on dodging his attacks in training fights rather than trying to counter them with sheer strength. He learned a bit from his older sister Lorrim would who specialised on unbalancing her opponents and throwing them through the air using their own strength and momentum against them, but never perfected it as she did. When his mother came home to celebrate her two oldest childrens‘ 19th birthday, she proposed to them to accompany her on fer next scouting mission. Eager to prove themselves, Veruk and Lorrim, immeidately tried to surpass each other in preparations and training fights in which they also involved Ronak and their younger siblings. Before leaving the world, the family would spend a week hunting in Uvera Prime wild lands as their final preparation. Veruk, Lorrim and Ronak should each take nothing more than a blaster, a knife and a medi pack with them to prove their ability to survive on their own based on their hunting, gathering, crafting and improvisation skills. When searching prey for their hunt, Ronak came across a strange beast‘s track behoofed but looking like nothing he had seen or heard about before. Next to the visible track, he could also smell blood and cold sweat. Curiosity got the better of him and he tracked the strange creature immediately without notifying his family members in any way. After an hour, the sound of a creature‘s painful cry would split the air warning him that the strange beast seemed nearby. Taking care to be as inaudible as possible and staying well hidden in the bushes, Ronak sneaked onward, until the strange beast finally came into sight. The beast was smaller than he had expected, and would only reach the height of his belly when standing upright. Its head with two horns seemed almost to large in comparison with its equine body standing on four skinny legs. A long bleeding wound on its flank had the poor thing panting and whine in pain and desparation. Cringing involuntarily at the sight and feeling with the suffering critter, Ronak started considering what to do. Before killing it to relieve it of its suffering he wanted to examine the injuries more closely. The creature‘s head and appearance made it clear to Ronak that this was a herbivore. Carefully, he collected some long bushels of fresh grass, freshly green leaves from a nearby tree before stepping into the open all the time focussing his concentration of the beast intently murmuring in a soothing tone. In the first moment, the creature looked like it would turn to flee again, but whether it was exhaustion or the soothing tone of the voice or maybe the influence of the force, it stayed and let the stranger step closer, until it could reach the plants in his outstretched with its mouth. Giving the beast time to adapt to his smell and sight and letting learn that he meant no harm, Ronak waited until it started chewing carefully on some of the leaves. Carefully, he would then turn to examining the wound which looked like one of the larger predators of the Uvena had its claws or fangs involved. Still talking gently to the beast trying to reassure that he wanted to help and not hurt it, he washed the blood from the wound. Even though the beast whined it neither fled nor attacked. Finally, he turned to collecting some herbs he knew would help prevent an infection, when the beast would slowly start limping behind him. Focussing intently on his search for herbs and the application of the herb paste which he would get from chewing the plants, Ronak was oblivious of a predator which had picked up the wounded beast‘s scent and stalked the two of them. When the bear-like predator broke out the underbrush, only quick reflexes saved him and his new beast friend from a claw thrash and bite. While Ronak was rolling back to his feet and reaching for his blaster pistol, the predator already rushed towards him and the injured animal. ‚I will not be fast enough‘, was his last thought before 5 arrows from the underbrushes struck the beast‘s chest killing it instantly, but not halting its forward momentum. When the body of the predator was taken from struggling Ronak, he saw the pelty faces of 5 Ewoks staring down on him. A sixth one with his arm in a sling was petting the injured beast he had saved before. „You saved our bordok?“, one of the Ewoks stated without introduction. Ronak just nodded at a loss of words at the strange sight and the excitement of meeting real aliens for the first time in his life. When finally recovering he pointed towards the paste which had been smeared on the ground during the fight, „we need more to keep it from getting sick.“ The Ewoks looked closely then nodded. „Get more!“, said the one who had spoken before. Once the beast had been taken care of, Ronak saw that some of the Ewoks had started preparing a camp and taking the corpse of the predator apart, roasting some meat over a camp fire. The one who had helped him with the beast finally smiled at him: „Thank you for helping Rik, my bordok. I am Arbo.“ The small warrior smelt injured but friendly. After introductions where Ronak learned all the Ewoks names, they enjoyed their grilled bear together and Ronak learned that they were here on a head hunting mission tracking an infamous criminal when a pack of predators had attacked them and injured their bordok which had fled to the wild. Curious the young Shistavanen asked them about their mission, but mainly about their home world and how they lived there. The tales of the forests of Endor truly impressed him and only increased his longing to travel to the stars. Wishing to stay longer with them and learn more of their tales, Ronak knowing the local fauna, flora and geography much better offered to become their local tracker, which they gladly accepted. During the following week, he learned a lot of survival tricks from the Ewoks as well as the basics of archery which unlike blasters was a completely silent way of hunting. Arbo even built a bow for him which was larger than the Ewoks bows and more easily usable for him. By the time when they finally tracked down their fugitive injured by some beasts and half starved, the appearance of the fierce looking, tall young Shivastanen hunter and 6 Ewoks was enough to bully the man into surrender without even having to fight. After returning to the next city and handing over the criminal, the hunters‘ group would go out for a final celebration, before splitting ways and the reward money. Even though Ronak would have loved to immediately leave the planet with them and explore the galaxy right away, he felt loyal towards his pack, his family who would be worried about him. When returning home his brother Veruk beat him up thoroughly, almost biting his right ear off in the fight. „Mother and father have been worried sick over you and you wander around with some aliens!“, he would accuse Ronak who did not even try to defend himself out of bad conscience of having let his family down. Rokar, Lorrim and Verruk had not left the planet, until learning he was save and only left after his return. Only when he had told his story and asked all their forgiveness for having them worry over him, would they leave with a group a head hunters, not the mercenaries they had original planned to go with. A month later, Ronak‘s father received a transmission from them telling at first that they were bound for hunting someone close to Hoth when the transmission would break off and leave the whole family puzzled and worried. Being now the eldest of the children at home, Ronak decided to follow his mother‘s, brother‘s and sister‘s track out to the stars he had always wanted to see. If he could learn something along the way that would be even better. Hiring on the first ship leaving Uvena Prime, he took his few belongings with him and left his home hoping to find his lost family members.